Triumph Triumph - Spring Unchained! Promotion Details | Available at Motohio located in Columbus, OH. Break free from winter and gear up for spring with Triumph’s Spring Unchained! 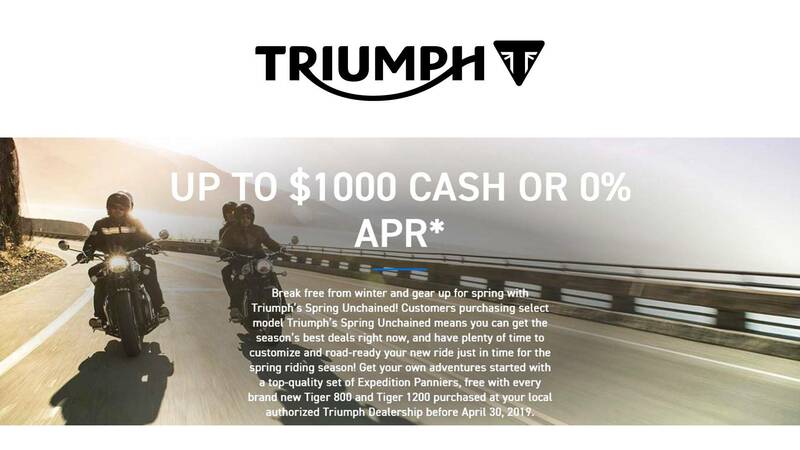 Customers purchasing select model Triumph’s Spring Unchained means you can get the season’s best deals right now, and have plenty of time to customize and road-ready your new ride just in time for the spring riding season! Get your own adventures started with a top-quality set of Expedition Panniers, free with every brand new Tiger 800 and Tiger 1200 purchased at your local authorized Triumph Dealership before April 30, 2019. Get your own adventures started with a top-quality set of Expedition Panniers, free with every brand new Tiger 1200 purchased at your local authorized Triumph Dealership before April 30, 2019. Tax, title, documentation, dealer prep, set-up, freight and other charges are not included, if included in purchase price your monthly and per day payment amount will be higher. Get your own adventures started with a top-quality set of Expedition Panniers, free with every brand new Tiger 800 purchased at your local authorized Triumph Dealership before April 30, 2019. See your local participating dealer for offer details.